Here is a column I wrote after the Carpionato Group had proposed a magnificent plan for a project in the Route 195 Corridor, taking up three development parcels east of the Providence River. Then the project sort of went away. Today, it returns. At 5 p.m., the Jewelry District Association will host an announcement by Carpionato of what I hope will be the same plan. Will it be as good? Come check it out at the newly renovated South Street Station (now part of the largely regrettable South Street Landing project). You can compare the new plan to a pair of images from the old plan above and below. And here is a link to “The Caprionato proposal for 195 land,” with more sketches. A week ago, Michael Graves, the celebrated postmodernist architect, designer and winner of last year’s Driehaus Prize for classical architecture, showed an audience at Brown University slides of his belongings in the renovated warehouse where he resides near Princeton University. These included his own paintings of Roman buildings and Tuscan scenery, which offered a sort of a sense of what they looked like. 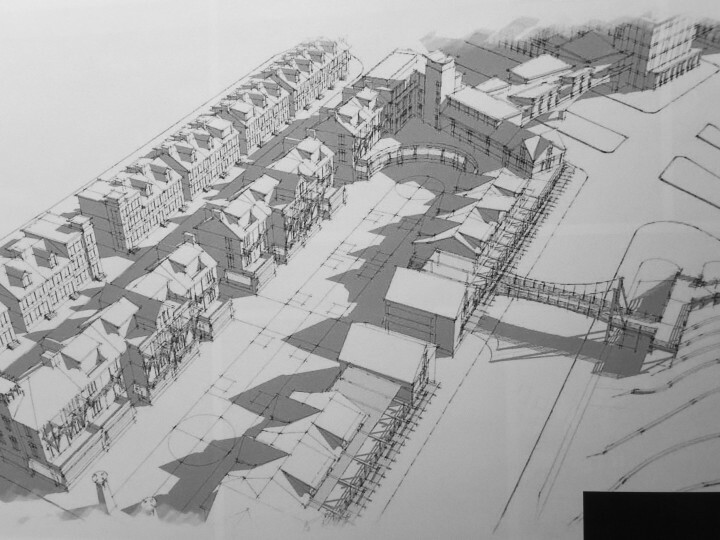 Graves’s paintings are the opposite of the sort of image (above) used by The Carpionato Group to illustrate its proposed development of land in Fox Point that was under Route 195 before it was relocated. The main difference is that Graves’s paintings are of places that exist, while Carpionato’s image, which it showed recently to the committee guiding the 195 development, is of buildings still to come. Odd, then, that the Italian scenes were rendered in a vaguely cubist form – okay, Graves seems a decent sort; let’s say his paintings are “dreamy” – while the Carpionato scenery that doesn’t exist was rendered in high precision. That illustration, which ran on the first page of the Feb. 24 Journal, was so lovely that I almost wept for joy. It reminded me of a rendering of an earlier Carpionato project, now almost complete. On Monday, I drove down to Chapel View, a retail/residential complex near Garden City, in Cranston, to see how well that rendering had been transformed into reality. Three of six granite dormitories of the abandoned Sockanosset Training School for wayward boys, erected in 1881-1895 as part of the “state farm,” have been knitted together within new structures of traditional character. The old chapel is now a restaurant, the Chapel Grille, and a lovely stone wall built by Carpionato encircles part of the complex. Still, the rendering was more pleasing than the final product. Fine old architecture can only be diminished by new additions whose design and workmanship do not match the original in quality. And it is fair to suppose that the original jail for juvenile delinquents was itself not intended to be of the very highest quality. That the project swims in parking lots does not help. Still, the latest Carpionato project on the old Route 195 right-of-way can be held to a higher standard and, set as it is in Fox Point, it should be. Here the Route 195 Commission should easily outperform the Capital Center Commission, which snatched defeat from the jaws of victory, inflicting GTECH and three modernist towers on the traditional cityscape built near Waterplace in the 1990s: Providence Place, the Courtyard Marriott and two (originally) Westin towers. An alternative to the Carpionato proposal – market-based development of individual parcels – might be expected to produce, in time, a great place. Today, however, many developers feel obliged to be “creative” (that is, tediously orthodox) and might produce, in time, a hodge-podge that could be in Anyburb, USA. Under these circumstances, a unitary plan might be more likely to result in a place people will love. The Carpionato plan has at least the charm of a composition that reads as smaller gabled buildings in a village vernacular, rather than a rack of twisted megastructures. Its style is embodied by a Ponte Vecchio-style bridge that spans Point Street, connecting two buildings. If Carpionato can get the details right, a truly attractive new part of town might emerge near the south end of historic Benefit Street. Many developers build projects that do not live up to their advance billing. Two unbuilt proposals by Carpionato for hotels in or near downtown Providence, in 2006 and 2008, hint that it is capable of overreaching. One hotel was to have been on a triangle of land at the northeast corner of Kennedy Plaza; the other was to have replaced a produce terminal in the Promenade District, which Carpionato tore down before its financing had been secured. That is a track record that should be easy to improve upon. The Route 195 Commission does not have a track record . . . yet. What it has is an opportunity to protect the public’s interest in good development. If there was a good reason for the legislature to give the commission its abundant regulatory power, that was it. Maybe someday, if the Carpionato Group, encouraged by the commission, lives up to its advance billing in Fox Point, Michael Graves will return to daub Providence in oils. David Brussat is on The Journal’s editorial board (dbrussat@providencejournal.com). This column, with more illustrations, is also on his blog Architecture Here and There at providencejournal.com. This entry was posted in Architecture, Development and tagged Carpionato Group, I-195 District Redevelopment Commission, Jewelry District Association, Jung Brannen, Providence RI. Bookmark the permalink. The changing Carpionato plans! 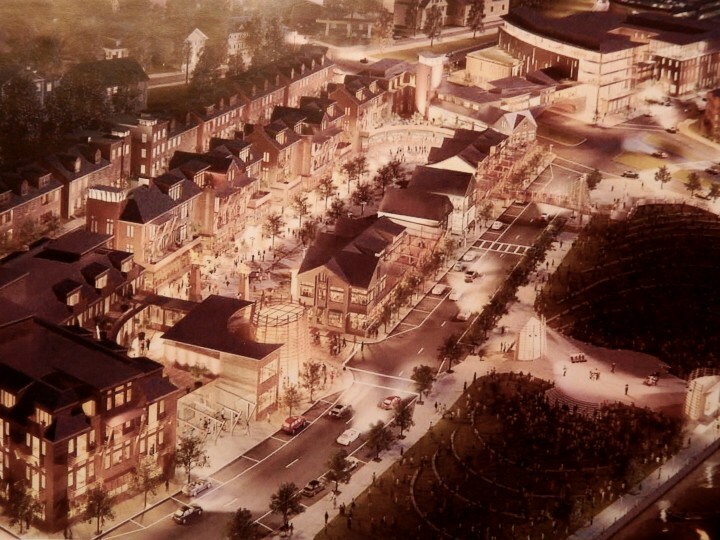 Chapel View promised no big box stores – and what is being courted? COSTCO and TOPGOLF… thank goodness for residents/voters who are on top of this – I fear it may come to prostrating ourselves in front of a proverbial tree! Hope not. A development in Providence is likely to be different from a development in Cranston (not that it ought to be). I don’t expect big box on South Water Street! None of the commercial buildings seem anywhere near big enough. Still, all I can go on for now are the aesthetics, and they are very good. I thought Baccarie had pro-osed this. No I think that was the smaller project adding ugly to a fine brick building on the most southerly 195 parcel.